Writer's block can last a day, two days, a week, a month - LONGER (!!) During that time, our scale of panic goes from mildly peeved to "am i even a writer anymore??" There are even countless - COUNTLESS - articles out there to get you through/over writer's block. Sources say, writer's block is a bad thing! Writer's block needs to be conquered! Writer's block is annoying! 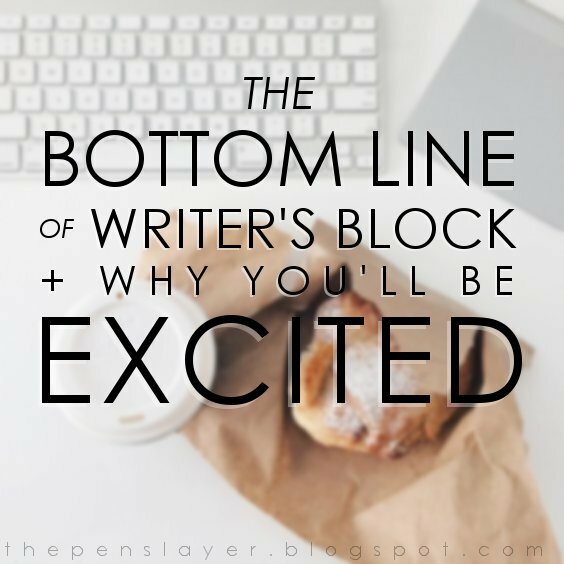 Writer's block is the bane of any deadline you ever had + all your hopes of productivity! NO. Just stop. The only thing about these last few lines that is remotely true is that writer's block is pretty annoying. We all treasure an edenic image that we can write like the wind without check, our "creative juices" magically pouring out like the Tigris and the Euphrates, and creating a gorgeous, lush plot for our readers. First of all, NO. | That idea that a really good writer will writing SOMETHING every single day? Some people can actually pull that off. That's fine. But for those of us who have strained and struggled and tried it and basically pooped dry, pebbly words onto a toilet-paper document, how comforting is the thought that, "Well, at least I wrote SOMETHING today"? IT DOES NOT COMFORT ME. I know that, tomorrow, I'm going to have to flush those terrible lines down the drain and start all over. So what was the point of writing that crap in the first place? Second of all, NO. | Writer's block is not the devil! It's our fault for believing that we are capable of churning out brilliant ideas ALL. THE. TIME. It simply is not possible. It is a ridiculous standard to set and it will only cause us grief. If you tell me you have not felt at least a twinge of guilt when a week has gone by without any progress shown on your story, YOU ARE VERY MUCH LYING. Your brain can't keep up with this impossible standard of 24/7 productivity. While there are many times when you have to buckle down + push, there are also times when your brain is just wiped out and needs to rest, and come up with the next leg of your plot. Plots are not Athena: they do not spring fully-formed out of your head - and, even if they did, you would have a massive splitting headache, okay? OKAY. I am a very intuitive, subconscious thinker/planner. A lot of my plotting goes on at a level that I am not even aware of. And when I am in "writer's block," maybe my brain is actually stopping at the crossroads to check its map and determine where to go next? Maybe it's taking a nap, maybe it's figuring out where to go next, maybe it's even taking a breather and dwelling on some completely-other subject so that I don't burn it out on one topic at a rubber-searing speed. True beans. My advice is to stop belly-aching over "a day of small things" and wait patiently until the next crop of ideas has ripened. If you try picking the fruit too early, it's going to be tiny, sour, and useless. Remember that some harvests will take longer to come than others. Some plots develop faster than others. Some minds work slower, have more things to deal with, and just basically need to tend to other things as well. There is //absolutely no guilt// in that. So just caaaaaalm down, everybody. Be diligent, but also be reasonable. This post reminds me of some academic advice one of my favorite professors gave me once upon a time... I believe it was advice he received from one of his undergrad professors. ANYWAY. This is what he told me: During the academic season, work HARD. Pour your everything into your work. But when you're on break, /be on break/. Truly take a break from study. Let your brain rest for awhile. "Be diligent, but also be reasonable." Perfectly said, Jenny. Can I offer an amen right here? I've realized that my brain does the best job at coming up with ideas/plots when my body is engaged in doing routine, repetitive work like gardening or cleaning or washing dishes. Well guess what? Over the past two years, my nice, tidy life been completely turned upside down. I moved from America to Africa, learned a new language, and had to figure out how to do new things, in a new culture, with new people. My routine is out the window, and my writing, as well, and I refuse to believe that's something I should feel guilty about. I am a writer, yes. But I'm also a Christ-follower and a lover of my fellow humans. And sometimes, the Christ-following and the loving of other people needs to take priority over the writing. I know enough now to know that I will probably return to steadier writing one day, when God gives me a lifestyle that supports it. In the meantime, I've enjoyed the challenge of still writing as much as I can, when I can. I believe there are seasons in life, and some of those seasons will see me increasing my word count at a steady pace, while other seasons will be filled with experiences that will make me into the kind of person who will be able to fill my words with beauty and truth. Right now, I'm in the latter...and you could look at it as an epic, two-year-long case of the worst writer's block ever, or you can look at it as another phase of my life...and a GOOD one, at that. I choose the latter perspective. Intuitive, subconscious thinker planner. That's me. My brother calls it my "pressure cookers". I can feel them working in there, but even I don't know what exactly I'm cooking. I've found that I ruin it if I pry it open to soon. But when I let it finish, it pops out beautifully. Same with my subconscious plotting for my writing. You're absolutely right on about taking breaks, embracing balance, letting your mind work things out while you're not paying attention, but I balk at "So what was the point of writing that crap in the first place?" Is there really such a thing as wasted writing? I try to write something every day even if it's not much just because I feel that if I don't my my writing will muscles atrophy while I'm not using them. It's a matter of keeping myself in shape for when I do figure out where to go next. And even when I delete words, I'm not deleting the practice I got from producing them—for me at least writing bad words is an inescapable step along the way to writing good words. There's no first draft that's worse than a blank page, somebody said.